Home » Yard Saling, Flea Market, & Thrift Store Adventures » Does She or Doesn't She? A few months ago I saw some local yard sale leftovers on Craigslist under the free section. I immediately drove over and picked up a lot of goodies. One of which is this Miss Clairol Hair Color Bath 46 Chestnut Brown from 1961. I'm planning to auction it off on eBay so I was trying to get an idea of how much it sells for and couldn't find any recently listed. I did notice that there were lots of ads up for auction. 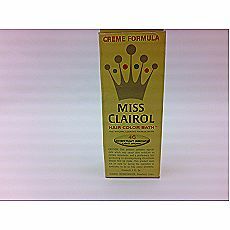 Miss Clairol was the first in home hair color and helped erased the weird stigmatism then associated with coloring your hair. Within six years of this campaign 70% of women were coloring their hair at home! Amazing what you can learn from researching someone else's trash. 0 Comments To "Does She or Doesn't She?"